Linking Margaret Mead to the Mickey Mouse Club and behaviorism to Bambi, Nicholas Sammond traces a path back to the early-twentieth-century sources of “the normal American child.” He locates the origins of this hypothetical child in the interplay between developmental science and popular media. In the process, he shows that the relationship between the media and the child has long been… much more symbiotic than arguments that the child is irrevocably shaped by the media it consumes would lead one to believe. Focusing on the products of the Walt Disney company, Sammond demonstrates that without a vision of a normal American child and the belief that movies and television either helped or hindered its development, Disney might never have found its market niche as the paragon of family entertainment. At the same time, without media producers such as Disney, representations of the ideal child would not have circulated as freely in American popular culture.In vivid detail, Sammond describes how the latest thinking about human development was translated into the practice of child-rearing and how magazines and parenting manuals characterized the child as the crucible of an ideal American culture. He chronicles how Walt Disney Productions’ greatest creation—the image of Walt Disney himself—was made to embody evolving ideas of what was best for the child and for society. 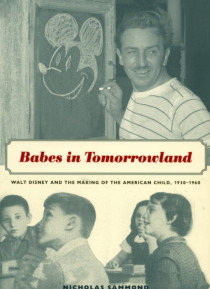 Bringing popular child-rearing manuals, periodicals, advertisements, and mainstream sociological texts together with the films, tv programs, ancillary products, and public relations materials of Walt Disney Productions, Babes in Tomorrowland reveals a child that was as much the necessary precursor of popular media as the victim of its excesses.